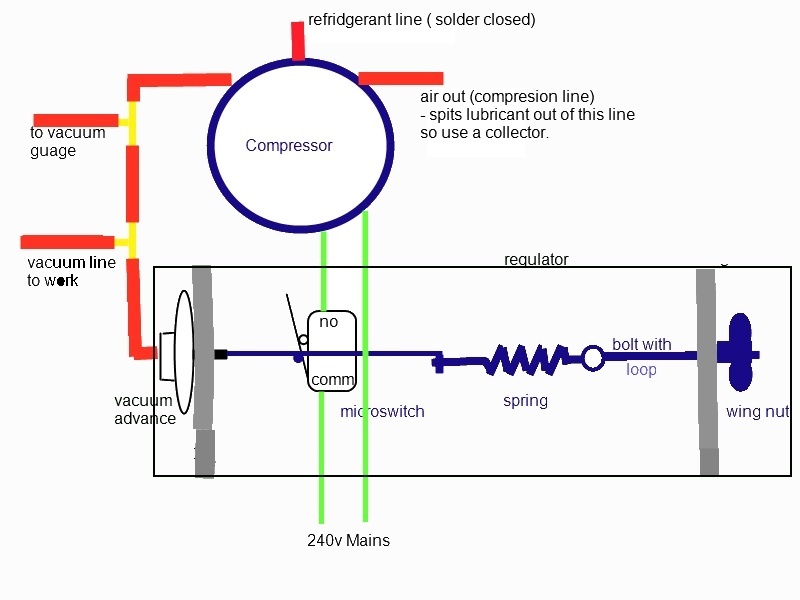 Here is the schematic for the pump showing the pneumatic lines in red and electrical in green. 1. 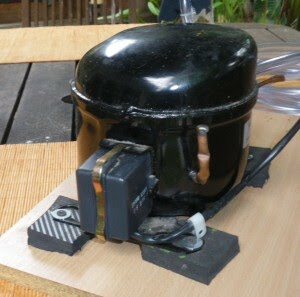 Mount the fridge compressor on the base board. I used a bit of chip board for the base and put pieces of rubber from a thong under each foot and then just loosely screwed it down. The rubber under each foot just reduces vibration. Remember that the compressor is full of oil so be careful not to turn it on its side or it will spill out everywhere. When the compressor is running it will spit some of this out the 'air out' line. This makes it necessary to have some sort of collector. I just used a long piece of tubing in put a few coils in it so that the oil will hit one of the walls at some point and drip back down. A rag over the end also helps to catch it and stop things crawling inside. 2. Put the pneumatic circuit in place. Connect the vacuum gauge in line with the pvc tube coming off the vacuum connection on the compressor. I was using 8mm tube and the copper tubes on the compressor where more like 4mm. As luck would have it the piece of fuel line I had from the carby was perfect for covering the resizing. I places the fuel line over the copper tube and then put the pvc pipe in boiling water to soften it and this let me easily put the pvc tube over the fuel line and make a really tight fit. The vacuum gauge used the same tubing size as the fuel line so I could have used a piece of this as well. I did this to step up the diameter of the t-connector that came with the gauge so that the pvc tube would make a tight connection. I placed a second t-connector (this time it was the one from Bunnings) so the diameters were right for the 8mm tubing. This allowed a line to be connected that would be the line used to connect to the vacuum bag. Then finally I connected the t-pieces together and then connected a tube that will go to the vacuum advance when its in place. At this stage you should be able to plug the compressor in and by placing you finger over the open end of the last bit of tube watch the pressure drop. When it reaches about 25 inHg switch it off at the wall and watch it to how quickly the pressure drops. You should see next to no drop in pressure. My set up lost about 1 inHG in 1 hour. This means its largely leak free. If it is leaking, try putting ties around the t-connectors and the connections to the compressor as this is the most likely place to get leaks. CAUTION - YOU ARE DEALING WITH MAINS POWER WHICH CAN EASILY KILL YOU. MAKE SURE ALL YOU WIRING IS PROPERLY INSULATED AND CAN NOT BE ACCIDENTALLY TOUCHED. 3. The regulator is laid out exactly as in the diagram above. I built a wooden box with the front and bottom open. On the inside back wall I put a 1 inch block of wood. This is where the microswitch will be mounted. IMPORTANT. AT THIS STAGE DO NOT FIX THIS BLOCK OF WOOD IN PLACE. ITS POSITION NEEDS TO BE ADJUSTED SO THE SWITCH IS JUST CLOSED WHEN THERE IS NO VACUUM BEING APPLIED. THIS POSITION WILL DEPEND ON HOW LONG THE LINKAGE IS AND WHERE YOU PUT THE PART THAT PRESSES THE SWITCH. 4. Drill a large hole in each end to let the vacuum advance armature and the adjusting bolt to pass through easily. In terms of location you want the center of it to be 1cm further off the back wall than the block of wood that you'll mount the microswitch on . 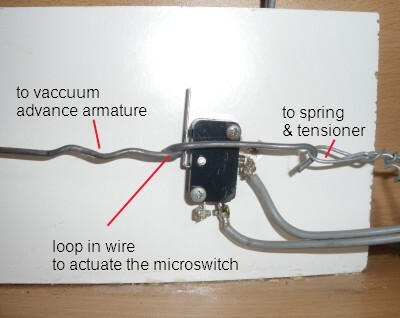 This is because the wire that you pass between the vacuum advance and the tension bolt needs to pass close to the microswitch which will be about 5mm off the mounting block. Also, drill a hole on the back near one of the ends so that you can pass the electrical wire through it for the switch. 5. Mount the vacuum advance on the left hand end. There will be a mounting bracket it already but you may need to bend it mount it on another wood block if the angle isn't right. 6. 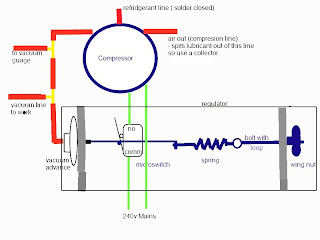 Make the linkage that runs from the armature of the vacuum advance to the tension spring. When sizing it up remember that the spring will connect to the tension bolt and the bolt must protrude a couple of centimeters out of the other end so that there is still plenty of thread inside the box so that additional tension can be applied to adjust the cut off pressure. 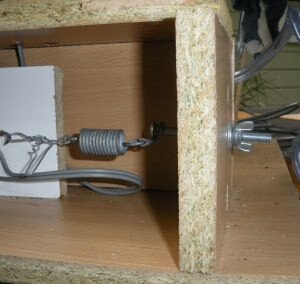 For the link from the armature to the tension spring I used some really stiff wire of the bed base. You could use piano wire or similar as well. Its important that it is stiff so that when it is holding the tension for a long period of time it should not stretch or loop (shown above) should squash down as this will change the cutoff pressure. I made a loop in the wire for the point that will press against the microswitch and squeezed this down with pliers. I made another wire link to connect this to the tension spring as the the orientation of the hook in the link and the natural way the spring sat didn't work and if I twisted the stiff wire it broke as it had already been worked a fair bit. This may not be necessary in your set up. 7. Assemble all the regulator bits except the microswitch. Screw the wing nut on to the tensioning bolt and put and screw the wing nut down a few turns to make it secure. Now you are ready to place the microswtich. 8. With the box assembled connect the pvc tube on the vacuum line to the vacuum advance. THERE ARE 2 WAYS OF PUTTING THE MICROSWITCH IN PLACE. A- In my construction I used the normally open contacts on the switch so that the regulator is set up so that when the pressure drops to the desired level the switch will open and the compressor will switch off. B - The alternative way is to use the normal closed connections on the switch and place the switch so that when the desired pressure level is reach the switch is closed by the loop in the link pushing against it. On reflection I actually think that the second way is better. The reason being that in A you must turn the tension screw so that lots of force in pulling against the armature in the vacuum advance so that it moves off the switch once the required pressure is reached. 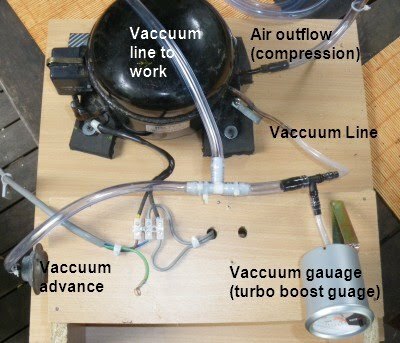 However, when the vacuum is released and the spring relaxes, all this force will be exerted against the switch and so there is a chance that the switch could be pulled of the mount. With B this is not the case as its only when the desire pressure is achieved that the any force is applied against the switch. This is a much better situation and easier to adjust to the desire pressure. To avoid this issue with A, the best that can be done is to store the compressor with the tension bolt undone so that there is no force against the switch and make sure to use long screws to mount it. 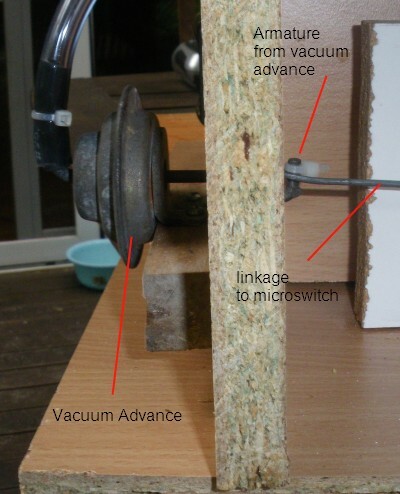 Continuing with A - with a little bit of tension in the spring, place the microswitch on the wooden mounting block so that the switch is closed and the loop in the link contacts the lever on the switch half way between the button and the fixed end. Mark the position of the block and the switch and then assemble the bits exactly this way. 9. Solder the wires to the appropriate connections (Normally On - 'no' for A and Normally Closed 'nc') and run them up through the box to the wire connector block that can be screwed to the top of the box. The switch runs in series with either one of the live lines ( i.e not the green earth wire in AUST) so just cut and connect one of these lines into the connection block according to the diagram at the start of this. IT WOULD ALSO BE IDEAL TO PUT SOME SORT OF SHORT CIRCUIT PROTECTION IN CASE YOU ACCIDENTALLY MAKE CONTACT WITH THE LIVE WIRES. COVER THE CONNECTION BLOCK SO NO ONE CAN ACCIDENTALLY TOUCH IT. REMEMBER THIS 240V AND IF YOU TOUCH THIS AND YOU ARE CONNECTED TO THE GROUND VIA VIA ANY MEANS AT ALL THEN THIS CAN KILL YOU. WHEN YOUR DEALING WITH 240V YOU SHOULD ALWAYS GET SOMEONE WHO IS QUALIFIED AND KNOWS WHAT THEY ARE TALKING ABOUT TO CHECK IT OUT, OR BETTER STILL WIRE IT UP FOR YOU. 10. Connect the earth wire to a point on the compress that has had the paint scraped back so there is a good connection. Connecting it to one of the screws that holds the compressor down might be a useful place to do this. Using the A method I used you need to crank in a few turns on the tension bolt wing nut and then just fire it up to see what pressure it is going to cut out at. To adjust it up or down FIRST TURN THE COMPRESSOR OFF AT THE MAINS. Then adjust the screw tension and then turn the compressor on again. LEAVE ABOUT 30 SECONDS BETWEEN SWITCHING IT OFF AND ON AGAIN AS RAPID SWITCHING ON AND OFF OF THE COMPRESSOR WILL TRIP THE OVERLOAD PROTECTION ON THE COMPRESSOR AND YOU'LL HAVE TO POWER DOWN AND WAIT ANYHOW. If you're using approach B then it dead easy. Put a lot of tension onto the screw and turn on the compressor and wait till the pressure drops to near the desired level and the quickly decrease the tension until the switch closes and turns off. Too easy!!!!! The final step is to high five yourself for a job well done!!!!!! Kiteboard Design - Broad Parameters. Rocker Table Pt2 - Designing the Jigs.